Discover a superior solution to decrease wrinkles, improve skin complexion, reduce skin irregularities – including stubborn acne scars – and achieve a healthier younger looking you… all in one session. 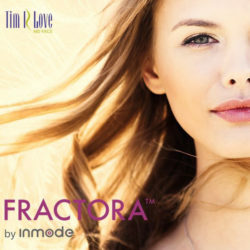 As Oklahoma’s trusted resource for noninvasive rejuvenation procedures, we are excited to bring to you the most effective bipolar radio-frequency (RF) treatment on the market: Fractora Fractional Skin Treatment by InMode. And, our Fractora treatment can safely be used in conjunction with our revolutionary FaceTite radiofrequency-assisted liposuction (REAL). Schedule your consultation today, and experience the Fractora difference for yourself. HOW DOES FRACTORA SKIN RESURFACING WORK? Fractionated radiofrequency energy found in Fractora is a scientifically proven method to reduce wrinkles. It is minimally invasive, using a matrix of micro pins to resurface and restore the skin, providing exceptional results with almost no downtime. Fractora treatments promote skin resurfacing creating dramatic improvement on acne scarring and signs of aging by fractionally ablating the skin and restructuring deeper tissue. Its RF energy heats the deep layers of the skin in a controlled way, revitalizing the collagen, delivering improved skin complexion and texture for a radiant and youthful appearance. Fractora can also be used to smooth acne scars. We use Fractora to improve complexion, reduce skin irregularities and restore skin to a smooth and refreshed appearance. You may notice results immediately, but typically the most noticeable results appear after two weeks. Improvements continue up to three months after treatment. Dr. Love can provide treatment with one or multiple sessions, depending on your needs. Please ask us about our skincare products to maximize results. Fractora can be used on all skin types as its unique properties allow even darker tones to receive treatment. Our patients have seen significant benefits. Dr. Tim Love will always discuss your goals, and together will create a treatment plan focused on an optimal outcome.